It’s said that, if you can’t find what you’re looking for, you should make it yourself. 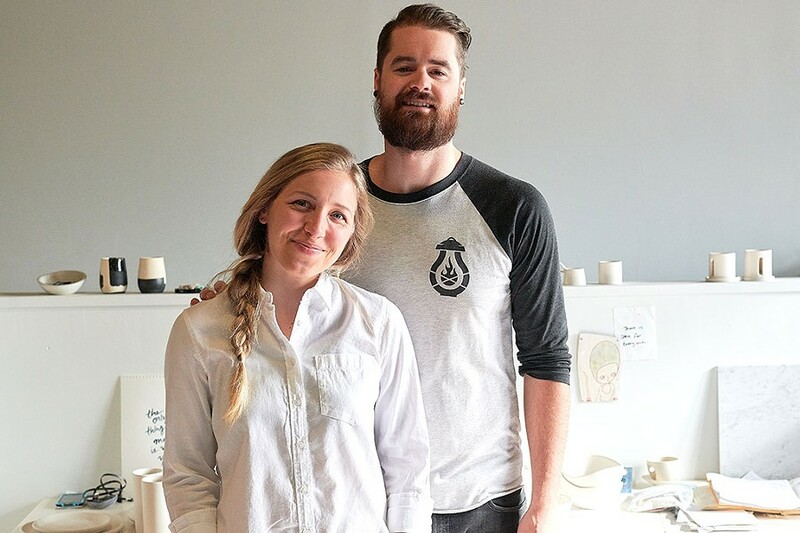 Ceramicist Brielle Rovito seems to have taken that philosophy to heart. A year ago, Rovito got married and moved to Burlington from Minneapolis, Minn., to be closer to family. Leaving a ceramics-focused shared studio, she was hoping to find something similar in her new home, but didn’t. So she started the Form Collective, which now hosts three ceramicists in a cozy second-floor studio at 180 Flynn Avenue. On Tuesday, May 22, 5-9 p.m., Rovito will host an open house with her studio mates, Taylar Main and Lindsay Van Leir, who moved in over the winter. The studio is now full to brimming, with racks of bowls, cups and vases waiting their turn in the kiln, but for a long time it was relatively empty, Rovito says. Just as importantly, having studio mates helps with bills. 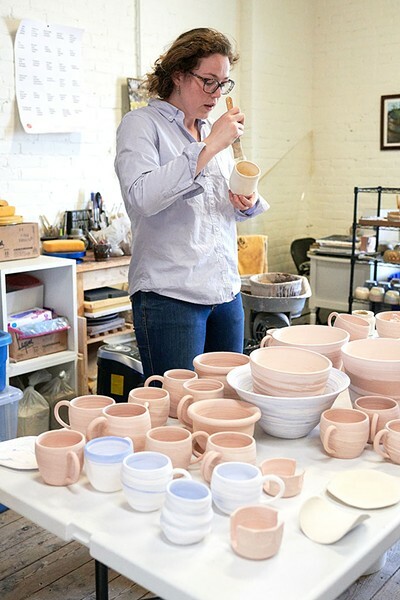 When Rovito started looking for a studio with kiln access in Burlington, her budget was just $300 a month. The week after her honeymoon, Rovito moved to Burlington, met up with a property manager and went on the hunt. In the first location they looked at, the carpeted floors and small bathroom wouldn’t work for messy ceramics work. Then the property manager showed Rovito the upstairs studio. “It was triple what we could pay,” Rovito recalls. “We had just gotten married; we were pinching pennies.” But she was enamored of the space and realized it would work better for her in the long run. So she and the property manager worked out a reduced rent that would allow her time to find tenants to share the studio. She sold her car, bought a kiln and moved in. For a while, she didn’t get any bites. But slowly, by connecting with other ceramic artists in the area and advertising through the South End Arts and Business Association and Craigslist, Rovito found the kind of colleagues she was seeking: ones who were beyond the hobby artist stage but could share a production space and benefit from a collective environment. 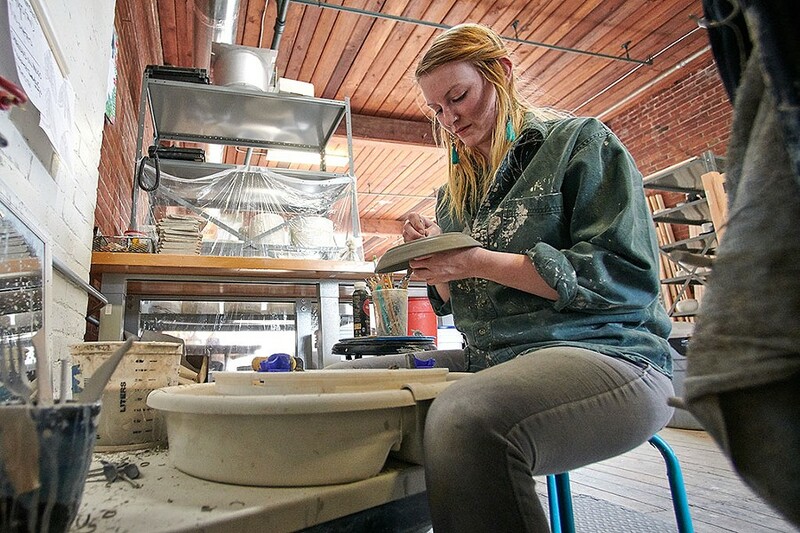 Ceramicists in need of a space to fire their work also can lease time in Rovito’s kiln, for $50 a load; she also plans to offer limited porcelain-casting workshops. While the three female ceramicists who now share the studio focus on functional wares, each has a distinct aesthetic. Rovito is a slip caster, making porcelain ware using a mold. Her work is elegant and simple: white and black glazed porcelain cups, bowls, mugs and other items with clean, smooth lines. The other two throw on the wheel, creating a variety of vessels. Main employs inky glazes and splashes of color to evoke moonlit, star-strewn skies. Van Leir opts for earthier tones and materials — rough grains and greenish hues.